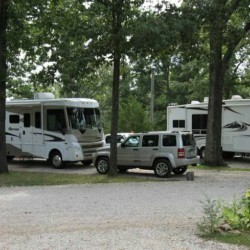 Camelot RV Campground/RV Park 100 Camelot Dr. Poplar Bluff, MO. 573-785-1016 Daily, Weekly, Extended stays, open all year. 76 Full-Hookups, 30/50amp, CATV, WiFi, Propane, Laundry, slideouts and tows OK. 20% discount. Food and car rental deliver to sites. We have Open, Shady, and Wooded level sites. Cable TV has 61 channels includes CNN-FOX-CNBC-ESPN-WEATHER and many more, WiFi throughout park. We appreciate your business and hope to have the amenities you need. Veteran Owned Campground. Note: We are NOT in a flood area. TN or Little Rock AR and St. Louis MO for your traveling needs. You Can Write Your Comments/RV Reviews below. Scroll to the “very bottom” of this page and write it. Family owned and operated since 1982. We offer a country/rural setting with forested hills, in the beautiful Ozark Foothills of Missouri. Poplar Bluff is known as “Gateway To The Ozarks”. You can relax, stay in, watch your favorite programs, catch up on the news, weather, your emails, or check out the area. We have camping with convenience in mind. Along with local activities people also enjoy the area springs, lake and rivers with canoeing, float trips, and water activities. A paved boat access to Black River is within a few miles. Our seasons offer brilliant spring and fall colors with winding scenic drives, and we provide year round camping opportunities for everyone. Make us your Campground Headquarters and enjoy the area. Since we are located just outside the city limits our close proximity makes it convenient for everyone’s shopping, dining, and entertainment needs. Some food companies deliver to your site. all the beauty and activities this area has to offer. Highway US 60 across southern Missouri is now four lane from I-57 in Illinois to Springfield Missouri. This is the best route between Nashville TN and Branson MO. Highway US 67 from St. Louis MO to Poplar Bluff, MO is now all four lane. If you wish you may scroll down to the bottom and write a comment/review. Read additional reviews. Click on reviews at the top of this page. Beautiful park! Nice, level spots. The easiest hookup we’ve ever encountered! Great campground enjoyed our stay very much. You have very good cable TV and WiFi connections, shade and we are not up against the RV next to us. Also no whooping and hollering to disturb us. We were so tried of bad parks, conditions and inconsiderate people but found yours to be outstanding and refreshing. Thank you for having a very nice park for weary campers. We loved our shady site. It has been hot everywhere and the shade trees looked really good. The sites were easy to pull into and they were level with good 50 amp electric. We enjoyed this park very much. Great fall color in this park. One tree in particular is a brilliant orange and it seems to glow. Good site it was easy to get in and out. We are on our way to Branson and will remember this park as a good place to stop. The cable TV in very good and we wanted to get caught up on the news. We watched some of the 33 miners trapped in the mine in Chile start coming up in the capsule. What a remarkable rescue! These are the nicest people you would ever want to meet. The camp site is very quiet with great sites. I would definitely recommend a stay here!! Very nice place to settle in for the night on our trip…we found this campsite last year while traveling. We will be stopping there again in April…very clean. Had a great weekend during the 4th of July. Very nice campground stayed 4 nights. Good level sites with good 50 amp. Sites are long enough for the tow vehicle and room enough to spread out. We have a 38’ motor home towing. Everyone in the park seemed to be nice. Something we really appreciate is no barking, yapping dogs running all over the place. Everyone kept their pets under control. We would stay here again and recommend this park to anyone. If you love a clean, well maintained RV park, this is the place to visit. Quiet park, friendly owners and residents, shaded sites, convenient location, a very clean park. We had a restful time and will come back again when in the area. Our visit is during the hot summer months, but I would love to see this park in the fall or spring – the trees would be beautiful. Hope to be back soon. We enjoyed our stay. Easy in and out. We came for a family reunion but it was so hot. Our air conditioner stopped working. We called the park owner and they called someone right away and had us fixed in no time. Very nice people. Enjoyed our stay, very nice park. Our site was level and the grounds are very well maintained. We would stay here again. Camelot RV Campground was a good location for us on our way to Branson. The sites were level, and the price was very reasonable. We received a 20% discount and their propane price was also reasonable. Would stay here again. Always enjoy our stay during the Christmas season. I like their propane station, it is very convenient to keep filled up. We also enjoy the Christmas lights around the entrance and in the campground. We have stayed at Camelot for several years and will continue to come back. Great Park! very well designed and a beautiful area. WiFi and cable TV is good, and the site hookups are good. We unhooked and went into town for dinner, upon returning after dark we saw a few deer in the park grazing on the grass. We would stay here again. We have a 36′ motor home. Good location, nice campground and people. We were escorted to our site, it was level with good hookups and the park is very nice. The amenities and price was reasonable paid $30.00. We received a 20% discount, payment is by cash or personal check they do not except cards. It has been very hot everywhere in the country and we enjoyed the shade. We will be back again. We have a 36 foot 5th wheel and two little dogs. Best location in the area to stay. Poplar Bluff has a VA hospital and I had an appointment but did not know where to stay. Someone recommended Camelot Campground as a good place to stay and they were right. We stayed three days in a really nice long pull through site. I have a 37’ motor home towing. This is really a good campground and the owner is also a veteran. One of the best campgrounds we have come across on this trip. It is so hot everywhere we go and no relief in sight from this heat!!! I enjoyed this campgrounds amenities so much since we could not get outside because of the heat. The cable TV was great and the Wi-Fi. This is one time I really appreciated the amenities a park offers. This is truly a nice and peaceful place to stay. I found it to be easy in and easy out. We enjoyed our stay. Enjoyed your campground. Had everything I needed, thank you for a great place to stay. Managed to contact everyone on my email with the good WiFi you have. We have a 30′ fifth wheel and the site was level. This is one of the most pleasant stays we have had in 12 years of RVing. Very long and remarkably level pull-thru sites, quiet respectful neighbors and services are as advertised. Owners are gracious. Enjoyed our stay. Good long pull through sites. The fall colors are beautiful all around us. This is a very nice campground. If we travel through this area again we will plan to stay here. Great location. We left the snow up north and found this campground to be open in the winter months. When we arrived we called and a person came to register and park us. Every nice and friendly. We have a 30 foot motor home towing. Good place to stay. There’s not many campgrounds open this time of the year. We like our site and decided to stay two nights. We have a 32 foot motor home. Good site with full hookup, cable TV and WiFi. We received a 20% discount and paid $29.00 for the two of us. Good price, we like the campground and would stay here again. Traveling in a 34′ motor home. Stayed a week. We were only going to stay 5 days but found out if we stayed 6 days we would get our 7th day free. We are here on business and extended our stay to a week and enjoying our time here. The park has all the amenities we need. It is still cold weather and we are glad they have a propane station in the park. We will remember this park as a good place to stay again. We had a good level pull through site, and we were escorted to our site. The campground was very clean and mowed. We would stay here again. Great park we enjoyed our stay and will be back. We have a 36′ motor home. Good Big Rig sites for a satellite view. Nice campground with very green grass and trees. We would recommend this park. Enjoyed staying here. Nice and shaded. Good sites, good amenities. We were escorted to our site. Stopped on our way to Branson would stay here again. Have a 36 foot motor home towing. Enjoyed our stay. We left TX going back north. We have stayed here several times and glad they are open in the winter months. Good long pull through sites. We have a 40 foot motor home towing. Been there 4 times that says it all. We enjoy the shade and level lots. Planing to come back in May for a month stay. We have a 37ft motor coach an car in tow it all fits in slot with room for company. Philbilly and Lee Vinson. Glad to find a campground open. We were traveling through Missouri and found ourselves in a blizzard. We have a good pull through site and hookups. The wind is howling but we are staying comfortable. Very nice people to come out and park us in this cold weather. Many thanks and we will be back. Good big rig sites and a very clean park. Heading to a rally. I will remember this park as a good place to stay. Traveling in a 40’ coach towing. Found this park to be a convenient location for us. We are pleased with everything and will return if in this area again. We have a 28 foot bumper pull trailer with slides. Been staying here for years. We have become well acquainted with the owners, they are good people. They always try to accommodate us with a site close to the pet area if possible. We usually stay a few days to a week. We have changed motor homes over the years and currently have a 37 foot with a tow. Wonderful island of respite! Well maintained, terrific staff, many different configurations of sites and it has everything! WiFi, TV, pet friendly and on and on. Loved it after a loooong day on the road. Office staff even escorted us to our site. Thank you so much for a great experience. Was heading back north a little more early than usual and found this park open. Very nice place to stay, good pull through site and hookups. Have a 37′ fifth wheel. Came up from Arkansas for appointment at V. A. Hospital.1st time at park. I have 40 ft. Phaeton w/4 slides, towing 2014 4 wd Dodge pick-up. Love the helpful staff, love the park. No problems. 5 star. Will come back again. Highly recommend. Good pull through site, easy in and easy out. We have a 38′ motor home with three slide outs towing. The campground is very well maintained. My husband doesn’t usually comment about the parks we stay in but he seems to like this one. Very great place to stay. We registered and was taken to our site. We want to mention we enjoyed all the amenities and a very will kept park. We paid $30.00. We have a motor home towing with 2 small dogs. We will stay here again. Lovely park….enjoyed our day of rest!! Nice to visit with you and prayers for good health. Good shady site with full hookup. We have a back in site in a lovely wooded area with trees all around us. Quite and relaxing atmosphere. Good place to stay. We have a class C motor home. If was our good fortune to come upon this park at just the right time of day. We were headed east and had just begun thinking we should get something lined up for the night. Our spot was easy to get in and had plenty of shade. The spot was so level, very little leveling was required. We were pulling a 23 foot trailer behind a double cab pickup. This was a really nice place to spend the night and we will definitely stay there again. Good place to stay. We visited family over the holidays and found this campground close to town with everything we needed. Not many campgrounds open this time of the year. Great place to stay. It was too windy to continue driving and we found this campground just off the highway. Good sites and hookups no problem getting in and out. We have a 37′ fifth wheel with four slides. Best place we have stayed. We have been staying here for a year working at a hospital. This campground is near town and has everything we need. They provide a mail box and address for package delivery and the pizza companies deliver right to our site. Good shade, good people, and quite. We highly recommend this campground. Great campground. Easy in and out good pull-thru site. We will be back. Traveling in a 37′ motor home towing a car.